Interned with HRDAG in the summer of 2018. Maria is working toward a BS in statistics & data science and Spanish at Yale University and expects to graduate in 2019. She’s also Code4Good’s current co-president and has a keen interest in how statistical methods can be used to address global issues. 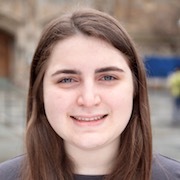 Outside of the classroom, she is involved with the Yale International Relations Association, does research in the political science department, and serves as an Undergraduate Learning Assistant for classes in statistics & data science and as a member Statistics & Data Science Departmental Student Advisory Committee. In her free time, Maria enjoys running, exploring and drinking tea.